Many times when I finish a project, I wonder if there was something I could do to improve on it, or to accomplish it using a different technique. I had so much fun with the kimono dress that I made for Scarlett and I still love it, but I got to thinking about a few little things I wanted to change if I ever made another. One of the things bothering me about Scarlett's other kimono was the lack of lining in the sleeves. I had lined the bodice with a neutral, off-white fabric, but didn't like how the inside of her sleeves looked when she raised her arm. The fabric just looked so thin and, I don't know, I just wanted to "magic" some lining in there somehow. Then I figured, if I lined the sleeves of the next kimono dress, why not take it all the way and line the skirt? Making a fully lined kimono dress, perfect for when the weather starts to cool off, while the unlined dress would be great for hot summer days. The past few times I've been in Joann Fabrics, they have had this funky, kind of "mod" looking flower print. I kept eyeballing it every time I went in there, vascillating between stuffing it in my cart, then taking it back out. EVERY time I went to Joann's I did the "fabric dance" with this bolt. Finally, the day came where the fabric won (I caved) because it just screamed "kimono" at me. Hey, no matter what anyone says, fabric talks. Sometimes you just gotta go with it. So I nabbed it, and picked up a black print (hard to see in the photo but it's black with an off-black kaleidoscope kind of flowery print), and a red ribbon to make the obi pop. This is one of those projects that just made me do a happy dance at the end of it. The sleeves, the skirt, and the bodice are all fully lined, providing a flash of color whenever the wearer moves. 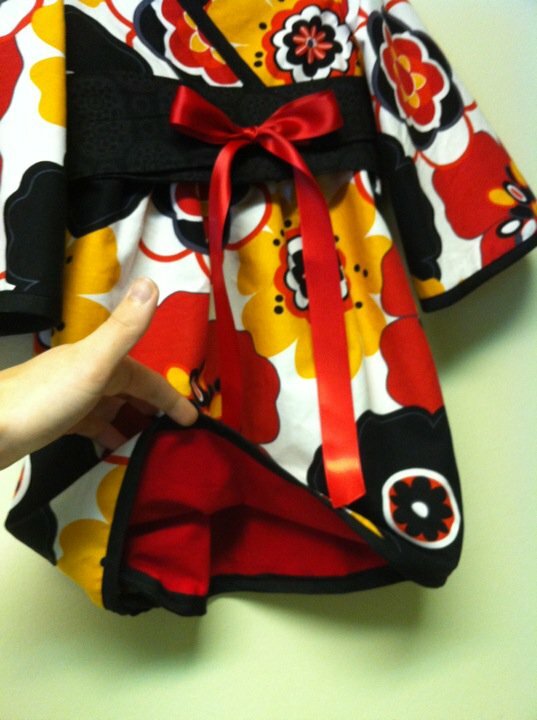 Speaking of the "wearer", I'm not sure if this is going to end up as Scarlett's kimono or not. I'm going back and forth on whether I should keep it, or set it aside to sell later if I ever open up the online shop I've been thinking about. Can't decide. Either way, I'm lovin' it. 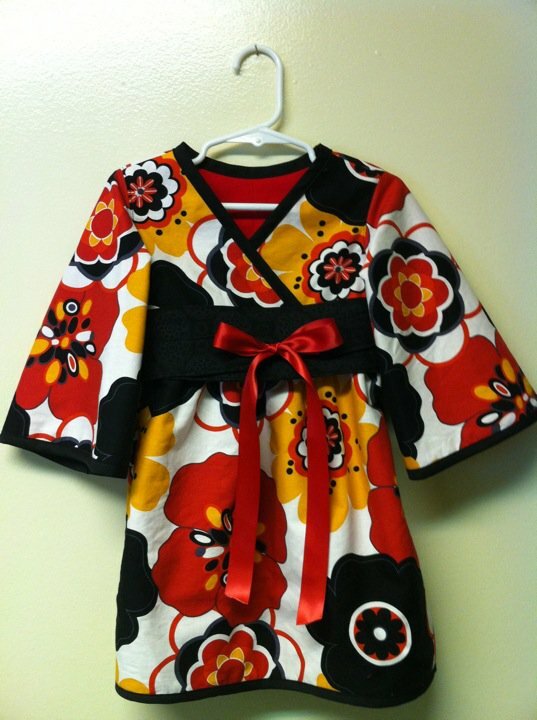 Kimono dress pattern from Mod Kid Boutique, fabric from Joann Fabrics. Lining of the bodice is included in pattern purchased, but lining the sleeves and skirt (not hard at all), has to be on you.